Happy Mother’s Day! 5/12/2013 | Travis the Warrior --- Kickin' Cancer! Happy Mother’s Day to all you mothers! So on Saturday, we headed up to get some Texan BBQ so that we could have a picnic out at Lake Conroe before the soccer game. The family was so nice and they remembered us and said that they wanted to treat us after all that we have been going through. We couldn’t believe it and even though we tried, they refused to let us pay for anything. Honestly, these are the type of amazing people we have met over and over again in Houston. Everyone is so kind and willing to do anything to help out perfect strangers. True examples of southern hospitality and we can’t thank them enough! We woke up on Sunday and we told Lynne that we were going to make her breakfast for Mother’s Day before we went to church. The thing is, the hotel provides a full cooked breakfast every day so all we could do is make her toast or fill her plate. We ended up making her a waffle at the waffle station in addition to her eggs, fruit, etc. It was the thought that counts, right? And she knows we love her! We had so much BBQ and ribs left over from Saturday, we decided to do another picnic after church on Sunday only this time at the hotel since Tyler and I had to leave in the evening to go back home. It was a great meal again and the company was even better. 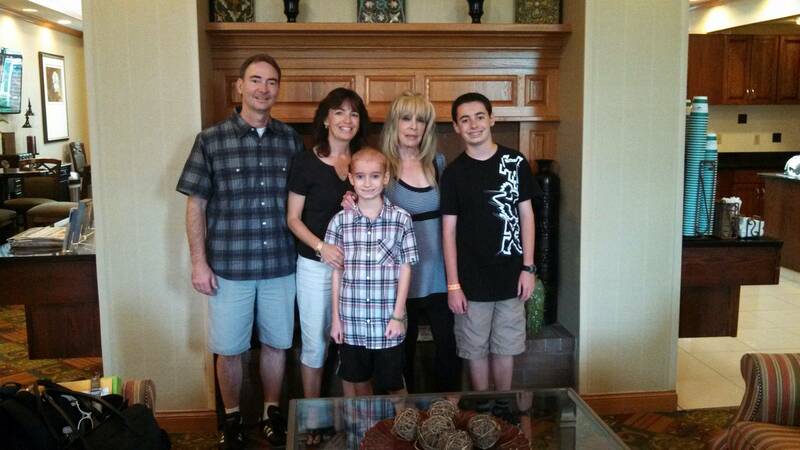 It was so nice we were able to have all of us together for Mother’s Day (Lynne, Tony, Tyler, Travis and Grandma). Happy Mother’s Day! Two more weeks to go…but who is counting?